Friends and family aren’t likely to find April McLemore shopping in stores such as Nordstrom or Neiman Marcus. That’s because she’s probably walking the aisles of TJ Maxx or Marshalls, eyeing the clearance racks and hunting for bargains. McLemore’s frugality extends to big purchases too. When she purchased her four-bedroom home in August 2008 for $151,000, she pre-qualified for more than $200,000 but didn’t want to assume a larger mortgage. “I am very practical about how I spend my money. I never want to be put in a position where I can’t afford something,â€ explains the Kyle, Texas, resident. 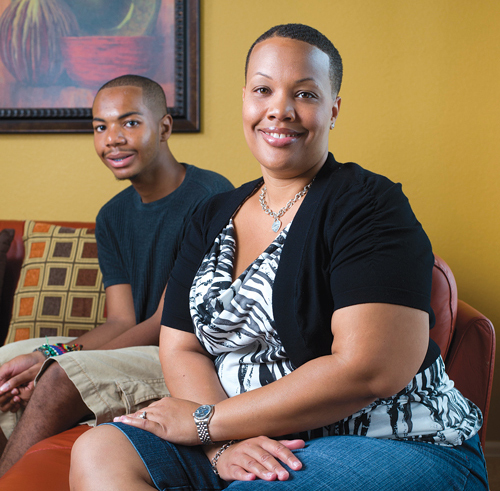 As a single mother of two sons, McLemore has always been concerned about budgeting and managing debt. “I pay cash pretty much for everything.â€ Not surprising, she has zero credit card debt. “I usually charge about $300 to keep my accounts active and pay off the balance at the end of every month,â€ she says of the three credit and two store charge cards she holds. McLemore does, however, have other debt obligations. She is paying $600 a month on a $33,000 car loan at 0% for her 2009 Nissan Maxima. She also owes $2,000 in school loans for some continuing education classes. As for her oldest son Rashaad, 22, a college senior, she bears no financial responsibility for his schooling. He pays his own way, largely with loans. McLemore expects younger brother Tariq, 17, a junior in high school, to do the same. McLemore is in solid financial position because she has a gross income of $120,000, cash reserves of $24,000 in a money market account, no college cost obligations, no credit card debt, a home mortgage at 5.375%, manageable car note, and $2,500 in monthly discretionary income. Her major financial challenges are that she needs to rebalance her investment portfolio and maximize her discretionary income to meet her goal of retiring at age 55, which is just 16 years away.